In January, Faber attended the annual Surfaces show in Las Vegas. We were surprised to see such a large number of attendees as compared with previous years. 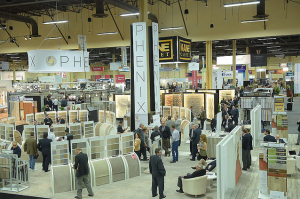 We had the sense in walking the show, as well as speaking with exhibitors and colleagues alike, that the flooring industry was poised for an up-market. Some trends that were evident during the event were English limestone looking technical porcelain tiles in cool colors, cement looking semi-polished porcelains in large-format sizes, reclaimed wood looking plank-format porcelain tiles, solid color glossy wall tiles with a wavy surface treatment, and the wild growth of the luxury vinyl tile industry. Faber will be adding all of these trends to our product portfolio this spring!